Veteran BJP leader Yashwant Sinha charged the current regime with resorting to lies on the note ban and the new tax regime. 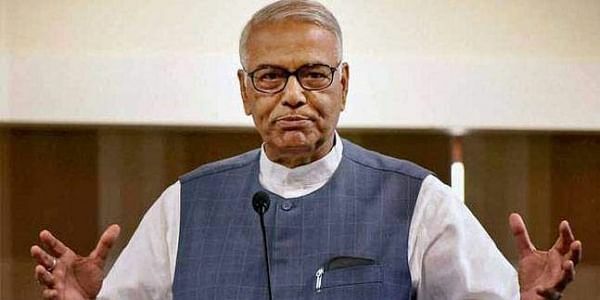 PATNA: On the very day the GST council performed yet another revision of rates, former Union finance minister Yashwant Sinha went for Arun Jaitley's jugular for producing "rubbish" in the name of a new tax regime. He urged the Prime Minister to sack Jaitley. “This finance minister did not apply his mind while formulating GST. That is why changes in the tax rates are being made almost every day. I’m saying with full responsibility that tinkering with GST will not help,” Sinha said to journalists in Patna. Mincing no words in a caustic assessment of the country’s economic condition, Sinha said the situation called for a new committee to fix problems plaguing GST. He recommended economist Vijay Kelkar to lead the committee. “The government should immediately form a committee under Vijay Kelkar, who has worked a lot on GST. Changes should be made to GST as per the recommendations of that committee. Or else no good is going to come from this GST,” added Sinha. Yashwant Sinha has been a bitter critic of the Narendra Modi government in recent weeks, and unruffled feathers in his own party with a searing critical article in a newspaper. On demonetisation, Sinha said he found nothing in it to merit a celebration of its first anniversary. “There are several aspects of it that appear just not right when we consider data,” he said. “Nearly all the cash came back to the system. The 99 per cent of the money that returned does not include the cash deposited in central cooperative banks and the cash deposited by Indians in Nepal. When they are back and counted, we will know how close to 100 per cent we are,” Sinha added.